This spring have some fun making confetti eggs with your children. If you haven't ever heard of confetti eggs, and they had never been part of your family customs, you may be curious, and want to try crafting some. They are quite easy to create but do take a little bit of time. Although confetti eggs might be new to you, they have been around for a long time. Confetti eggs have their origins in China and were brought to Europe by Marco Polo in the 13th century. At that point, the eggs were filled with a scented powder and were used as part of the courting ritual. Men would throw the eggs at women they desired to impress. Eventually, the tradition of the confetti egg traveled to Mexico and became an important part of the Latin culture. The Latin’s replaced the scented powder with confetti and used the eggs for many of their festivities. The Latin and American cultures blended along the southern border, and the confetti egg (called Cascarón in Mexico) became an Easter holiday tradition. After the confetti eggs are made, the tradition is to break an egg over your friend, or loved one's head while they make a wish. The confetti flies all over when the egg is broken. This practice is sure to please the younger participants of your spring holiday celebrations. Whatever the reason for making paper filled party eggs, the tradition is here to stay. Fun will never go out of style. Using a pin or the point of a sharp knife crack the top of an egg gently several times until you have an approximately one-half inch hole. Pour the egg out of the shell into a container, and save the raw egg for cooking at a later date. Wash out the egg shell completely with soap and water. Let the egg shell dry completely. Remove the inner skin of the egg shell. 6. Color the egg with Easter die or paint the eggshell with acrylic paint. 7. Let the egg dry completely. 8. You can either use store bought confetti or make your own. I used a paper hole punch to cut small circles out of shiny silver wrapping paper, but you can use any paper. Many people like to use tissue paper because it is light and comes in a variety of colors. 9. Make a funnel out of a sheet of paper. 10. Fill the egg with confetti using the tube. 11. When the egg is one-half to three-quarters full, glue a small circle of tissue paper onto the hole. The tissue paper will seal the confetti inside of the egg. 12. If you are using acrylic paints, you can paint the tissue paper seal the same color as the rest of the egg. 13. Let the seal dry. 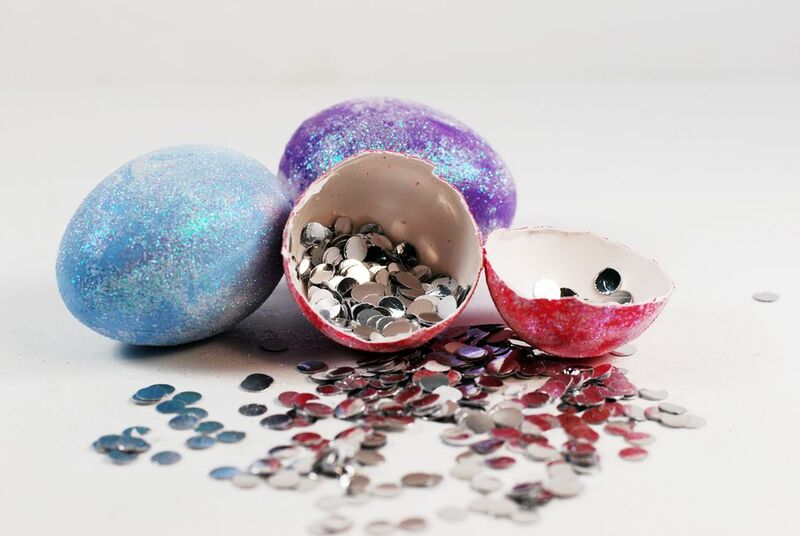 If you like to make shiny party favors, you may decide to add glitter to your eggs. All you have to do is brush some white glue onto the egg and roll the egg in glitter. Let the fun begin! Find a friend and smash a confetti egg over his head while he makes a wish. This tradition is sure to be a hit with the younger participants of your celebration. Part of the importance of family gathering and traditions is making beautiful memories. Your children will look back fondly on their childhoods when remembering fun family activities and events. Confetti eggs will be one of those party traditions that they will want to pass on to their children.